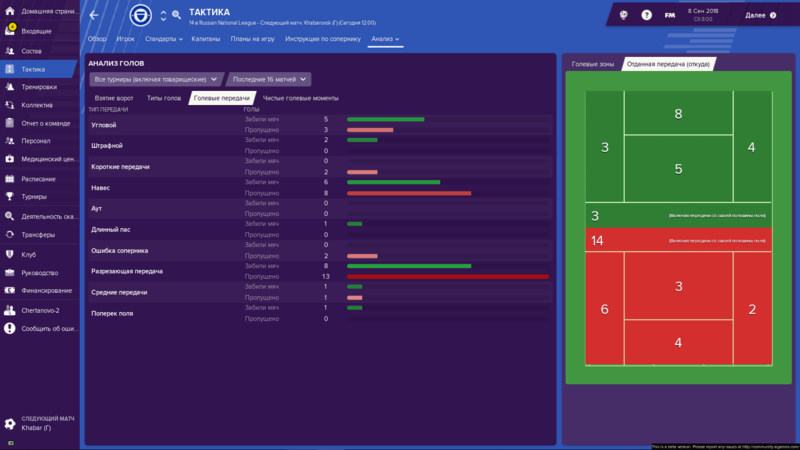 Tactical problems FM19. Bugs or no? Hi, guys. Im from Russia. I dont speak english. Excuseme for my english. Two problems in FM19 beta. I dont know this is bugs or not? 1) Long passes behind backs central defenders. When a my team turnovers the ball opponent instantly performs a long pass behind backs central defenders. Deep back line and regroup in transition dont help. My central defenders play to close opponent forward and do not interception. Its bug or attributes my defenders? My team and team of AI many heads are scored after corners on far post. When zonal marking defenders too close to the near zone and center. The far part of penalty area is always open. Im used zonal marking (5 player). My farthest player is not at the far corner of the goalkeeper zone but by the level of the far post. AI with a different method of protection similar problems. 1) CB's mark FW too much close. Consequently they can't catch long passes or blocked FW. Instructions like regroup and deep line of defense dont solve this issue. Too much free space in this little area in every case of corner. Defensive units take a wrong position and cant mark opponents. Also defensive units predominantly focus in near post and center zone. Consequently empty spaces in zone of far post.